Defragmenting a hard drive with Windows 7 is simpler than ever — in fact, you don’t need to do a thing . . . sort of. 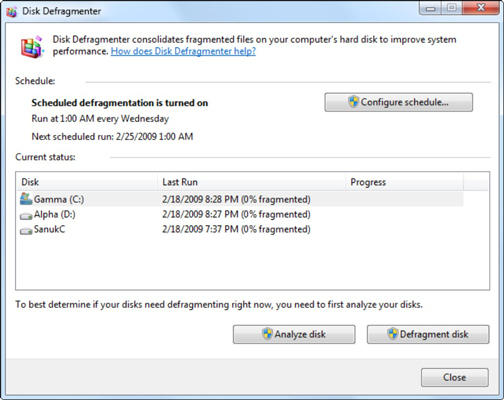 By default, Windows 7 automatically schedules a disk defragmentation session to run every week. However, you do have to ensure that your computer is ready for the defrag process. Not too long ago, defragmenting your hard drive rated as a Real Big Deal. Hard drives would get increasingly cluttered with random bits of files that were scattered all over the surface of the drive causing a number of problems; however, few people bothered to defrag their drives before the process was automated. With Windows Vista, Microsoft automated the defrag process but removed the user interface. A user had no way of knowing how far the computer was in the defrag process — which could take hours — and they could only schedule one drive at a time. Many people complained about the lack of control, so Microsoft redesigned the process for Windows 7. Now, when you open the Disk Defragmenter (Choose Start→All Programs→Accessories→System Tools→Disk Defragmenter), you’ll see the familiar schedule box, but you’ll also see a Current Status box that shows you each of your drives, when they were last defragmented, and a completion percentage for the current session. Windows 7 automatically defragments once a week. Windows 7 doesn’t defrag solid state drives, such as flash drives. These solid state drives don’t need defragmentation. Besides, they have a limited lifespan, so there’s no need to overwork the drives. Windows 7 schedules the defrag to run when it assumes you won’t need the computer, usually around 3:00 a.m. If you have your computer turned off at the appointed time, no defrag occurs. Check the time that your defrag is scheduled to occur so that you can leave your PC turned on that night.